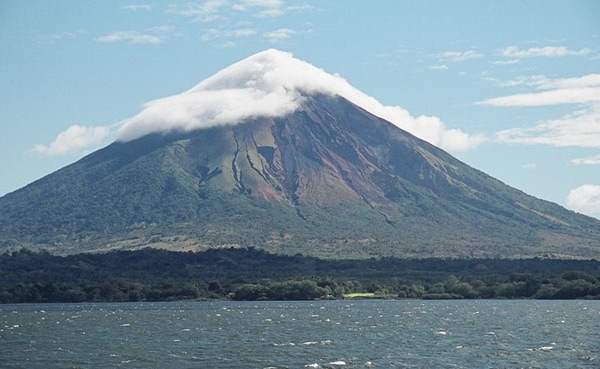 Land of a thousand volcanos… little heard from, but of great importance – then & now. Once renowned for an exceptional Criollo with beans twice the size of other varieties until a devastating plague wiped much of them out early in the 20th century. The earliest surviving accounts of cacáo, & much of what’s known about its pre-Columbian production in the Americas comes from here, written about by naturalist Gonzalo Fernández de Oviedo, & shortly thereafter by Italian traveler Girolamo Benzoni; both of whom disdained chocolate, calling it fit for pigs. Larry Steinbrenner dispels the conventional wisdom that cacáo here naturally hails from up north in the Yucatán, courtesy of the Nicarao migration out of Mexico. 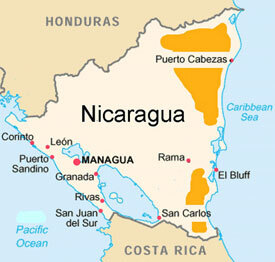 They ventured into an area in modern day Nicaragua originally inhabited by the Chorotegas. Oviedo, in his comprehensive survey spanning from 1527 to 1529 – later published into the detailed account titled Historia General y Natural de las Indias, mistakenly claims the Chorotegas were not cultivators of cacáo. That they in fact were leads Steinbrenner to posit a southern connection still waiting to be validated. Though Nicaragua & Mexico share many similarities with respect to cacáo usage (metates [grinding stones] & el dios del cacao [a chocolate god]), there are differences too that point to a South American influence. Specifically, a link to Chibchan-speakers in the central highlands of present-day Colombia who used cacáo in a more medicinal way, as well as consuming its pulp in a drink rather than its seeds/beans. For example, inhabitants in Nicoya (Nicaragua) also drank the pulp & used cacáo as antivenin for snakebites, applied it as a salve, & sunscreen as well. Steinbrenner extrapolates from this that cacáo possibly traded along with the Chibchan & its very presence in what’s called Greater Nicoya (an area encompassing modern Pacific Nicaragua & NW Costa Rica) drew the Nicarao in the first place to leave their Mexican homelands. 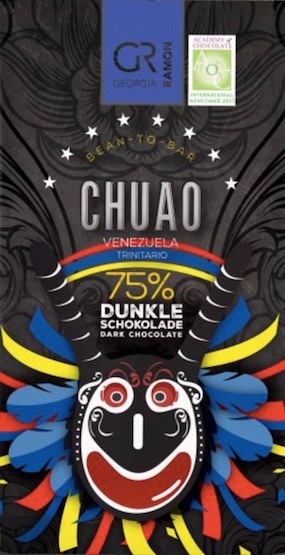 If true, this places Nicaragua at the crossroads of chocolate culture. Whatever the exact provenance, pre-Hispanic cacáo production centered around the town of Tecoatega in the vicinity of modern Chinandega, including some rumored to be the ancient cacao real (‘royal cacao’, perhaps descended from Soconusco Mexico or Mayan Guatemala). By the time of the Contact Period in the 1500s, cacáo was ubiquitous throughout, stretching NW from the wealthy plantations in León to Jaén in the SE, on the slopes of Mombacho Volcano near Granada in-between, harvesting the finest quality even after it blew an earthquake in 1570 where it grew abundantly under the shade of the Gliricidia sepium or madre de cacao (mother of cacao) trees. René Millon, whose extensive work includes When Money Grew on Trees – the highly trenchant account of cacáo that pre-dates the Coe’s more popular True History of Chocolate – reports that the ancient trees were closely related to Criollo despite external signs of green-red tint on the fruit pods suggesting a heterozygous mix. He echoes Hart in 1893 describing the best as ‘Creole’ & other types a variant called ‘Alligator’ (or ‘Lagarto’ in Preuss’ words circa 1901) – a reference to its skin warts. 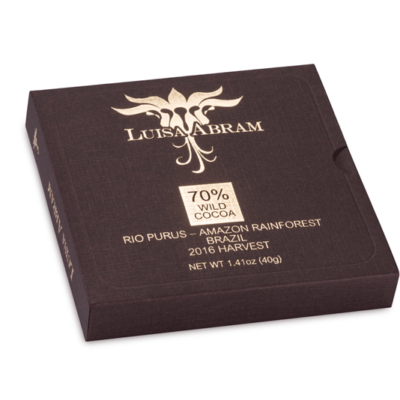 Of rather uniform variety nonetheless because Criollo was expressed internally by white beans twice the average size of other varieties, with only 20-30 filling a whole pod. All these scouts confirm Oviedo’s original account, who way back when also observed that fruits were no more than a hand’s breadth in length & the diameter of a wrist – of the largest pod! In other words, large seeds / small pods. Several of these plants made their way to Trinidad before plague nearly wiped them all out early in the 20th century. Some have been re-introduced in a back & forth between that Caribbean island & the Central American mainland. Several have gone on to become very productive contributors in breeding programs around the world – the most prominent the ICS line of clones (particularly the self-compatible ‘ICS 45’) – enjoying wide distribution throughout the Caribbean & even the emerging Old World groves to substantiate that more than just Amelonado made it into Africa’s cacáo genes. Additionally, Preuss’ notes lead to reasonable speculation that the Criollo which Spanish settlers moved from Central America down to Venezuela during the 17th century probably originated from here, the only difference being the attenuate apex of the fruit & larger seed size found in the Nicaraguan variety. 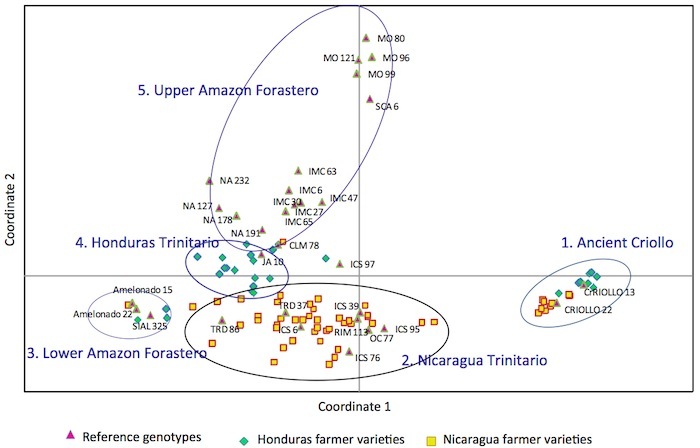 Cacáo from Trinidad that traveled back up to Nicaragua in a return trip altered the genetic pool such that native stocks were less productive & less adapted to their own environment than the foreign ones. But analysis conducted on accessions housed in gene banks indicate that even today most of Nicaraguan cacáo belongs to the Criollo group. In 2012, Kun Ji, Dapeng Zhang, et.al., analyzed the DNA of 84 cacáo trees picked randomly from orchards in southern Honduras & northern Nicaragua. 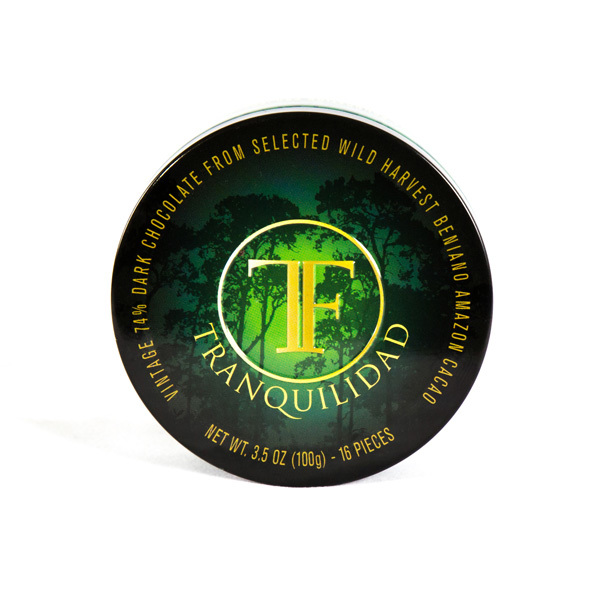 Ancient Criollo accounted for roughly a quarter of these growers’ varietals while a handful showed for pure Amelonado. The rest comprise hybrids variously clumped together under the label ‘Trinitario’. Of those ‘Trinitario’, all but one trace their parentage to Amelonado (in other words, very little Criollo lineage). That’s the official science, which only covers so much of any given area. Better still, informal reality supports these findings. The peripatetic J. Sandy Hepler treks thru the backwoods of Nicaragua hunting old cacáo, whether on flat land or up into the back mountains. A field-type kind of guy driven by practical curiosity – to discover supreme tasting cacáo – he lets the ‘chocolate angels’ guide his nose & eyes along the trails. Whenever he makes an accidental find, he likes to camp out close-by & experiment with custom fermentation… very old school. Sandy reports that his field-study confirms much of what the scientists know & some surprises too. Remarkably, northern Nicaragua cacáo production (Matagalpa/Matiguas region) is plagued by Monilia disease yet cacáo on 3 large properties around the lower part of Mombacho (east, west & south sides) have none, including one amongst the last surviving of the old cacáo centers in southern Nicaragua, inexplicably bypassing the area. Some attribute the absence of monilia to the region’s substantially drier climate compared to northern Nicaragua. Being situated well below the cloud-forest level higher up in the mountains also helps. Another factor: impeccably clean agronomic management… greater spacing between trees… improved airflow… & weekly pruning. Ominously though, locals perform lots of field grafting onto 50-60 year old trees & never bothering to separate out by type… too poor to care or bother. The same story everywhere: only way to save older varietals is to pay premiums. One grove — San Emilio – stands out & begs further attention. It lies on the south side of Mombacho, right on the edge of what was once miles of cacáo production stretching all the way down to Rivas. This may be the last existing orchard of the huge swath historically called Nicoya. San Emilio does sort its cacáo by separate varietals — Lagarto, Manzano & Papayo. Lagarto is rather famous, very old-time Criollo complex. Many of its pods contain approximately 20% white seeds. The Manzano reputedly caters an amazing taste, reminiscent of its namesake (‘apples’ in Spanish).